This Organic Sophie the Giraffe Diaper Cake is completely made from scratch and is perfect baby gift for any mom awaiting a baby boy. 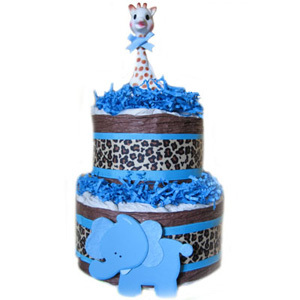 Decorated with chocolate whip cream, high end blue and animal print ribbon, this diaper cake makes a unique and delightful baby gift. Wooden animal shape, perfect to use as decoration in babies room.